A long, long time ago, there was a wolf. One day the wolf didn’t manage to catch anything to eat for a whole day. He was really hungry. 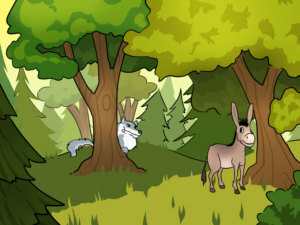 As he wandered around the forest he saw a donkey. 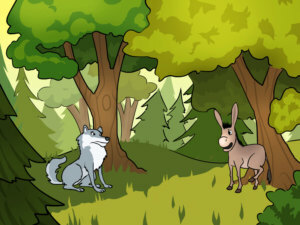 The wolf crept up silently behind the donkey, but the donkey had noticed him. 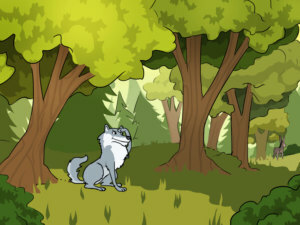 He knew that the wolf could run faster than him and he could not escape by running. So the donkey thought up a clever way to save his life. 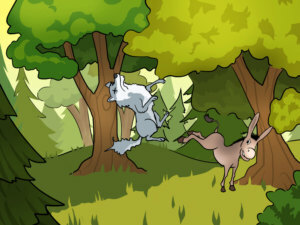 The donkey pretended that his leg had been hurt and he started crying in pain. The wolf went up to the donkey and asked why he was crying. 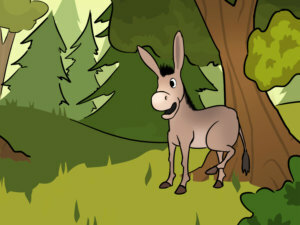 “I have a thorn in my foot and it hurts really badly, but I can’t get it out”, the donkey replied. “I can help you! If I eat you now, it will stop hurting!” offered the wolf. The donkey had been expecting that answer and answered quickly, “That’s a good idea, but if you eat me with the thorn, it may get stuck in your throat later”. “But if you remove the thorn first and eat me second, everything will be alright", he added. The wolf, who did not know about the donkey’s plan, thought that it sounded like a good plan and agreed to take the thorn out. The donkey had been waiting for the wolf to bend over. He kicked the poor wolf so hard that the wolf fell down and couldn’t get up onto his feet again. The donkey then ran away as fast as he could. He had saved himself from being eaten by a wolf. A little wisdom can do miracles.